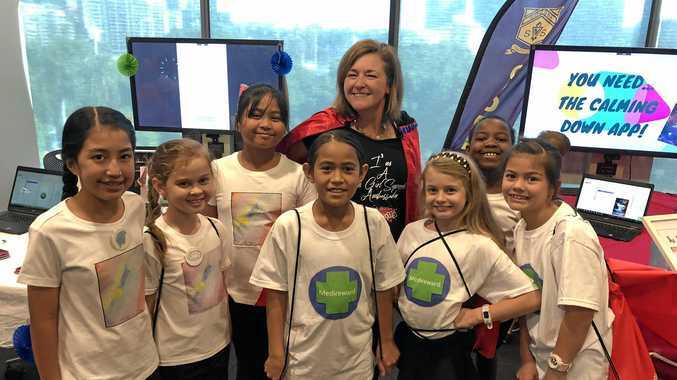 YOUNG entrepreneurs from Goodna State School wowed audiences with their app inventions at the Next Tech Girl Superhero Expo, which was held at the Queensland University of Technology. The expo is aimed to give young girls access to technology programs to build their skills and their confidence, while also installing a love of STEM. Digital technologies pedagogical coach, Jay Page, said the school had 38 young girls from Years 3 to 6 meet in the computer lab twice a week to participate in the Next Tech Girl Superhero program. "During the program the girls identified a local community problem to solve, conducted market and consumer research, wrote a business plan, built a working app prototype and created a pitch video," Mrs Page said. "As part of the program the girls were connected with female industry professionals. "The ladies supported the students weekly via email and video chat. "Our girls developed a professional relationship with their tech mentors." One group of girls from the school impressed the judges with their Calm Down app, which was created to be a benefit for children who found themselves overwhelmed with emotions. Their app features calming music created by the girls, breathing techniques, meditation, yoga and a punching bag. Their app made it through to the state finals. Another app, titled Medireward, was named as a state winner. The Medireward app has two targeted audiences. It notifies a parent when their child is due to take medicine and rewards children for taking their medicine with a piggy bank token.